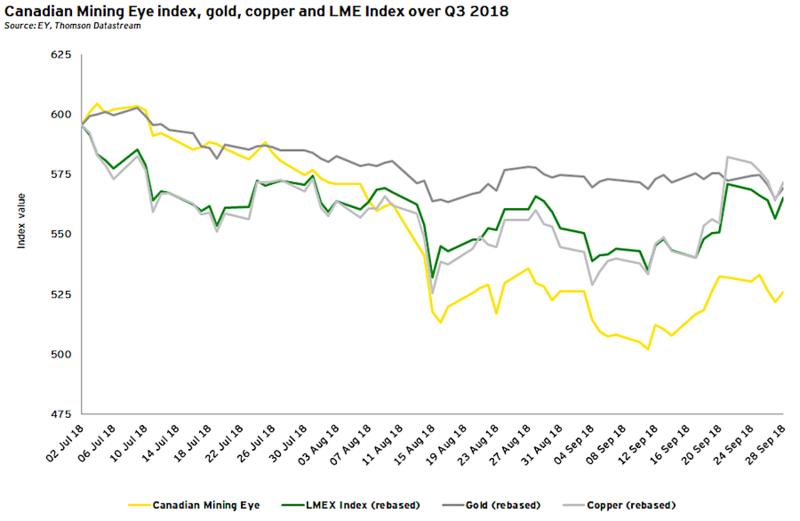 Canadian miners' performance slipped in the three months leading to the end of September, due mostly to weaker gold, nickel, copper and zinc prices, the latest report by consultancy Ernst & Young (EY) reveals. Following a 5% drop between April and June this year, gold prices decreased by another 5% in the third quarter, mainly due to the strong US dollar and the recent Federal Reserve rate hike of 0.25% in September. Copper prices, in turn, fell about 14% after hitting a 3.5-year high in June and nickel prices decreased 16% in the period, compared with a 12% gain in Q2. 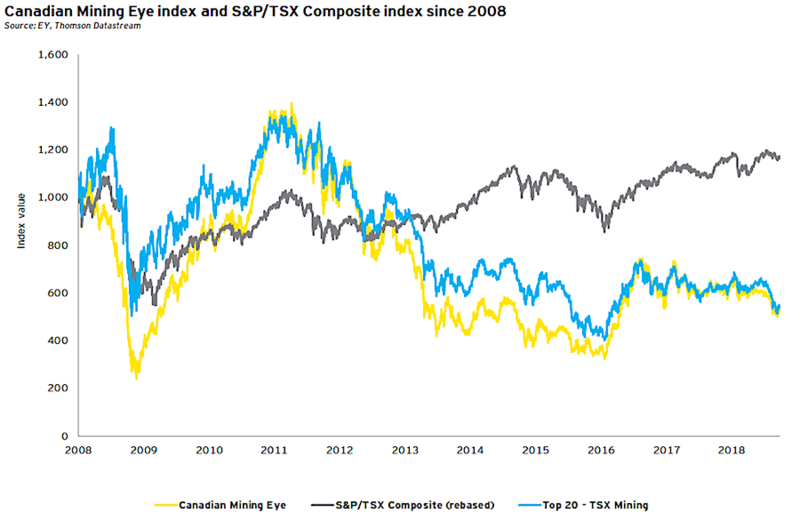 As a result, EY's Canadian Mining Eye index - which tracks the performance of 100 Toronto Stock Exchange and TSX Venture Exchange mid-tier and junior mining companies - dropped 12% in the third quarter of the year when compared to the previous three-month period. Source: EY Canadian Mining Eye Q3. "Despite the decline in prices, most of the large-cap gold companies are looking to finish the year strong," Jay Patel, EY Canada Mining & Metals Transactions Leader said. "Because of improving grades and production ramp-ups, most senior companies have maintained their production guidance for the year." Looking ahead, the experts say, gold prices are expected to benefit from the ongoing trade tariffs imposed by the US. Also, the upcoming seasonal demand for physical gold, mainly from China and India, will likely support the upward trajectory of prices, the team predicts. The near-term possibility of one more rate hike this year and likely three more in 2019 are expected to strengthen the US dollar and act as a headwind to gold prices, they noted. The report is also optimistic about the outlook for base metals, with copper prices expected to trend higher due to supply deficit, coupled with China's stimulus to increase investment in railways and the national electricity grid in 2018. However, trade protectionism will likely put downward pressure on prices in the medium to long term due to the potential impact on China's export of goods to the US. The outlook for zinc prices remains positive in 2018 due to supply constraints before balancing out in 2019. Supply is expected to increase through 2020, supported in part by start-up or production ramp-up at Dugald River, Vedanta's greenfield Gamsberg mine, New Century mine and Glencore's Lady Loretta mine. And when it comes to nickel prices, EY anticipates an increase due to strong demand from rechargeable batteries used in electric vehicles (EVs) and declining inventories by year-end. The latest Mining Eye experienced 13 changes in terms of constituents, as Ivanhoe Mines and OceanaGold climbed up to the Top 20. 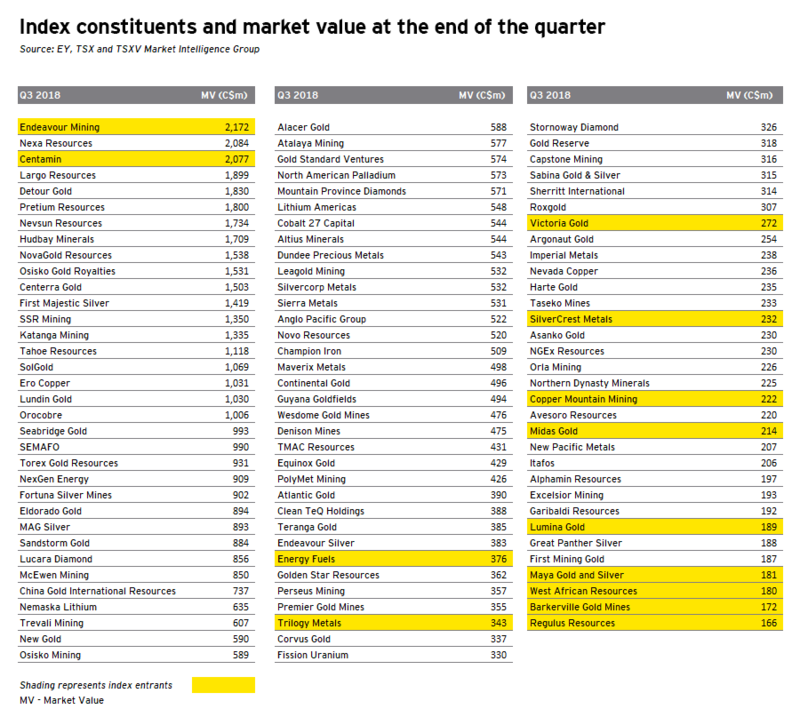 Lydian International, Barkerville Gold Mines, Mason Graphite, Bear Creek Mining, eCobalt Solutions, First Cobalt, West African Resources, Millennial Lithium, Klondex Mines, Arizona Mining and Dalradian Resources exited the index and were replaced by entrants highlighted in the table below.